William Moginie is primarily remembered for his design of a folding, portable microscope that was manufactured by C. Baker from 1867 onward (Figure 1). Moginie was an employee of Baker when his microscope pattern was first released. However, he evidently operated an independent optical business before, and possibly simultaneously with, his employment by Baker. Moginie separated from Baker by the end of 1868, and thereafter ran his own, well-regarded business. In addition, Moginie was a skilled photographer and manufacturer of photography equipment. His obituary in the Journal of the Royal Microscopical Society stated that “as an amateur (Moginie) was one of the first to produce micro-photographs, some of which have never been surpassed” (Figure 2). The image of one Moginie microphotograph contains the date 1857. 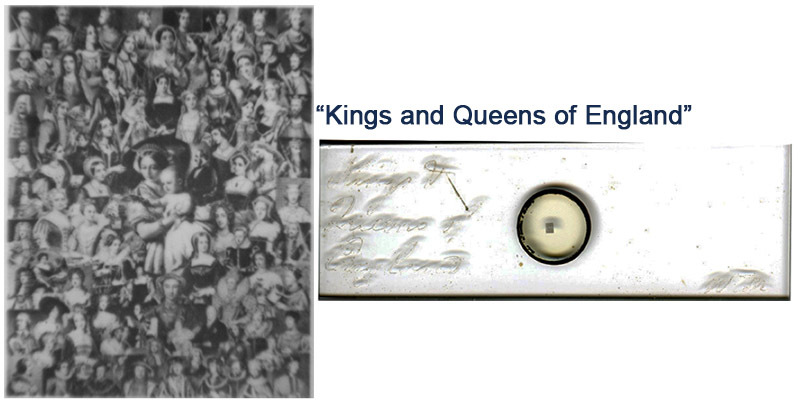 Moginie’s microphotograph slides generally have the description hand-etched into the glass, along with Moginie’s initials. 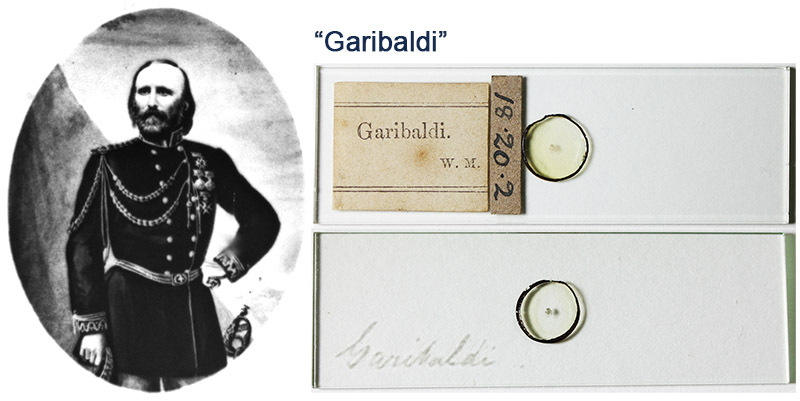 There is good evidence that Moginie sold his microphotograph slides: numerous duplicates of his work are known, and typeset labels are occasionally encountered. 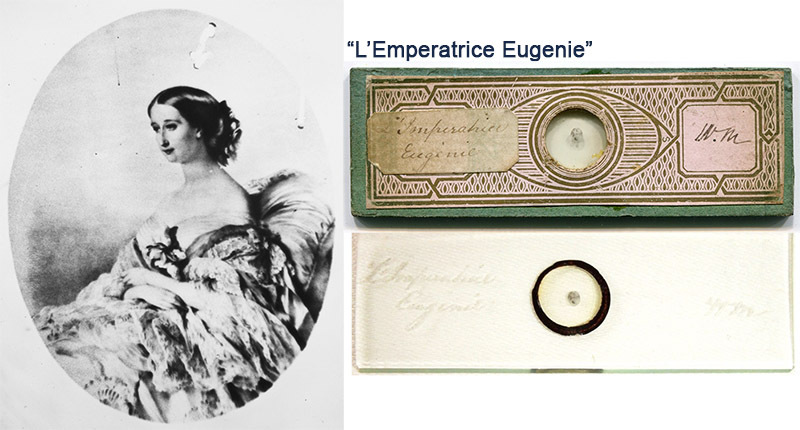 Periodically, other sorts of slides with Moginie’s name or initials show up at auctions, some of which he probably made, and others he bought (Figure 3). These were most likely from Moginie’s personal slide collection. 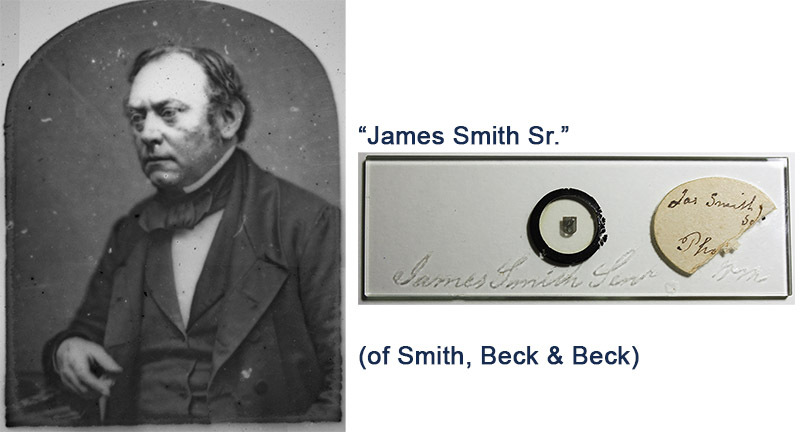 He was a member of both the Royal Microscopical Society and Quekett Microscopical Club, and frequently exhibited specimens at meetings. Figure 1. A Moginie-pattern microscope, manufactured circa 1867 by C. Baker. 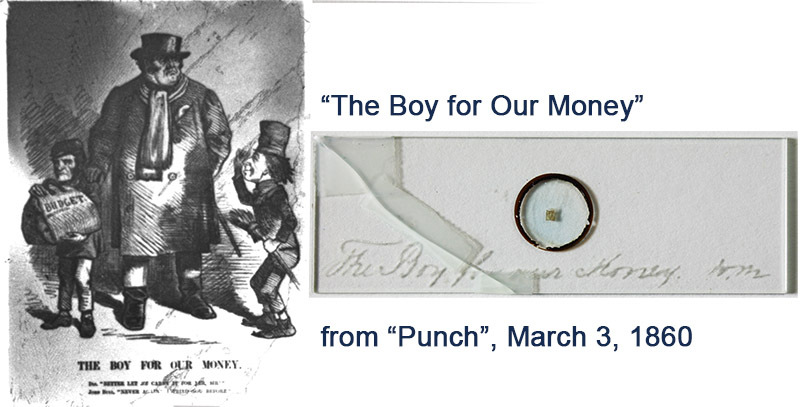 Images courtesy of Yuval Goren, http://www.microscopehistory.com. William was born on September 13, 1828, the first child of Cornelius and Harriet Eliza Wood Moginie. Cornelius was a successful “cheese and bacon monger”, wealthy enough to afford multiple house servants and to send William to boarding school. The 1851 census recorded that the 22 year-old William was a clerk in his father’s business. That occupation, at such an advanced age, suggests that William’s later successes in photography and optics were either self-taught or acquired by attending classes, rather than through an apprenticeship. One of Moginie’s microphotographs includes the date 1857, so we can safely assume that he was then proficient at the art (Figure 2). Several copies of that slide are known, suggesting that he sold his work. 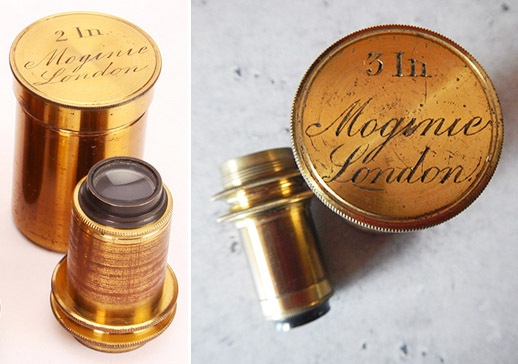 Moginie patented a “photographic camera and tent combined”, in 1859, a further indication of early proficiency. His invention greatly simplified production of wet collodion photographs in the field. That technique requires the photographer to coat the glass plate, then expose and develop it while still wet. Moginie’s contraption allowed the plate to be “coated, excited, exposed, developed, washed, and fixed, in any place where the apparatus can be set up”. At a meeting of the North London Photographic Association, “Two of Mr. Moginie's tents were erected in the room for exhibition - one a tent only, the other camera and tent combined, weighing only 9 Ibs. They attracted a considerable share of attention, and, long after the meeting had closed, many of the members were discussing the merits of both”. William licensed his photographic tent to Negretti and Zambra, who included a drawing of the apparatus in their 1859 catalogue (Figure 4). Figure 2. Examples of all known microphotographs that can be attributed to William Moginie. Multiple examples of all are known, supporting the conclusion that he was a professional. The community will greatly appreciate if any readers can share other examples of Moginie’s microphotography work. 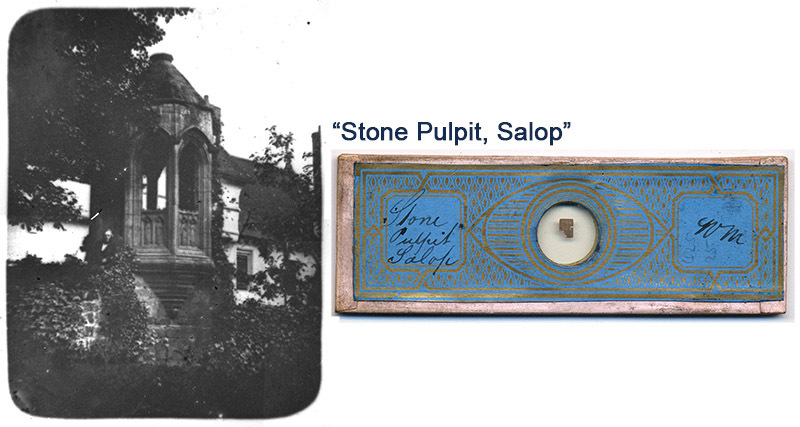 An unidentified man is standing beside the Stone Pulpit in Moginie’s microphotograph – his significance is not known. 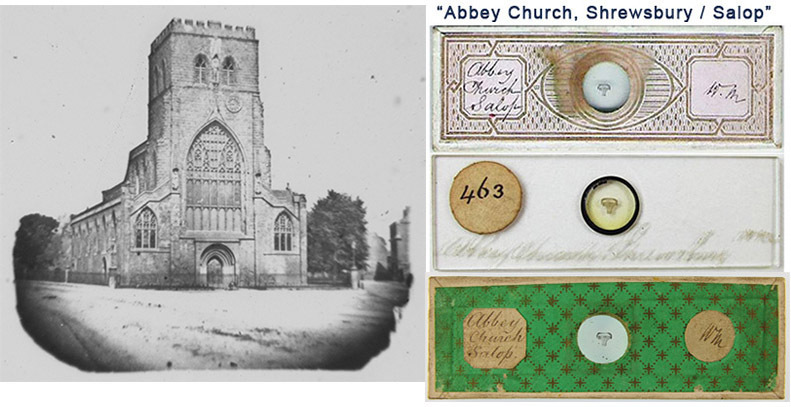 William’s elder sister married into a family with Shropshire connections, which may explain his photographs of that area. Figure 3. 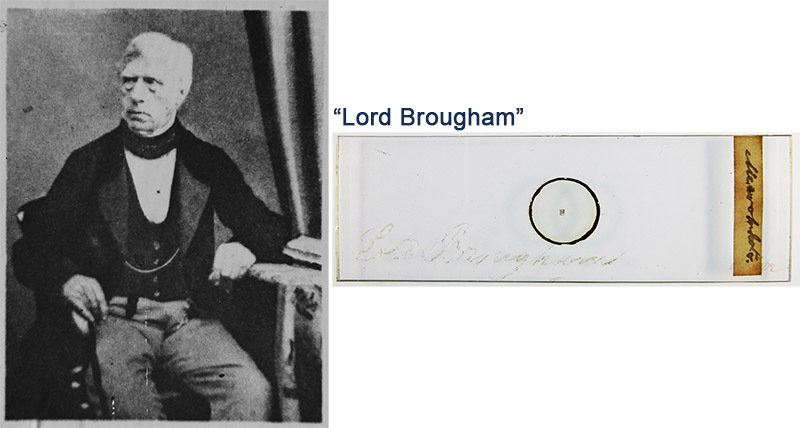 A microscope slide that was once owned by William Moginie. It is a preparation of Pleurosigma formosum diatoms, prepared by professional slide-maker John Barnett (the mounter’s handwriting is distinctive), and is used by the courtesy of James McCormick. Figure 4. 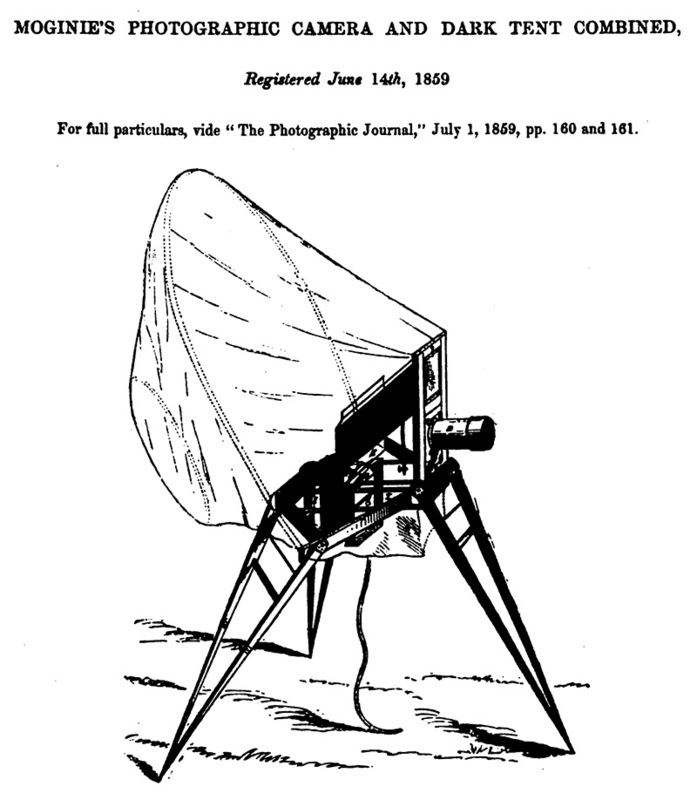 Moginie’s combined camera and tent apparatus, from the 1859 Negretti and Zambra catalogue. Their description: “The above apparatus is constructed to enable photographers to work the wet collodion process in the open air, without requiring a darkened room. It differs from the usual apparatus employed for the purpose, inasmuch as the whole of the process is conducted in one enclosed space, instead of using a camera and tent, thus reducing the bulk of a travelling apparatus at least one-half, and dispensing altogether with one tripod stand. When erected, the working space measures 3-ft. by 2-ft. 6-in. by 3-ft. in height. When packed for travelling, there are two cases, each measuring 15-in. in length, 4-in. in width, and 9-in. in depth. Pictures can be taken with combination, single, or stereoscopic lenses of any range of focus, from 3-in. to 17-in., by altering the position of the frame, in the open space. The lens can be placed in four different positions by moving the front, and the plate holder; is provided with the necessary adjustments for focusing. Frames and shutters are not required, thus avoiding many difficulties often experienced by photographers, such for instance as finding the plates too large or too small for the inner carriers. The cistern contains water sufficient to wash a dozen plates. 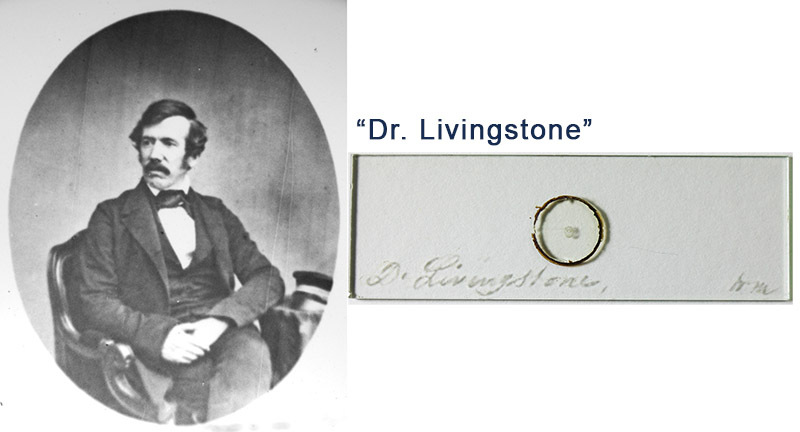 The glass is held in its place by a strong spring, while focussing with the fine screw; the prepared plate occupying exactly the same position when the ground glass is removed, must of necessity be in perfect focus. The bath contains the nitrate of silver solution. Light and ventilation are obtained from the window. This apparatus is the most portable yet offered to tourists, and particularly adapted for travelling. The advantages of this apparatus are: The plate is coated, excited, exposed, developed, washed, and fixed, in any place where the apparatus can be set up. The price of the whole apparatus, complete with every requisite, including lens, chemicals, &c., and tripod stand, varies from 10 to 15 guineas, according to the size of the plate it is constructed to work with. Full instructions sent with each apparatus”. The 1861 census showed him living with his widowed mother (who was supported by funds from Cornelius’ estate), at 4 Grove Terrace, Saint Pancras, London. William still lived there at the time of the 1871 census. However, the probate of his father, dated March 4, 1861, gave William’s address as 244 Holborn, which was Baker’s business address. The 1861 census was undertaken on April 7. This implies that Moginie, in 1861, lived with his mother and siblings, and worked for Baker (and, perhaps, sometimes lived on Baker’s premises). Also in 1866, a “pocket compound microscope” was described in several journals, and described as “introduced by Mr. Moginie, at Mr. C. Baker's”, and “devised by Mr. William Moginie, of Messrs. Baker's establishment” (Figure 5). On January 7, 1867, J. Newton Tomkins presented to the RMS on Baker’s new travelling microscope, stating that “The whole merit of this arrangement is due to Mr. Moginie, of Mr. Baker's establishment, a member of our Society; it is only after many trials that he has succeeded in bringing the ‘Travelling Microscope’ to its present effective form” (Figures 1 and 6). Tomkins’ report was widely reprinted, including in Jabez Hogg’s ” Printed comments by the editor, and the The Microscope. Moginie developed more than just microscopes for Baker. His microscopist’s air-pump was described by The Popular Science Review as, “Most of the air-pumps in use by microscopists are large, inconvenient, and expensive. Mr. Baker has, however, constructed one which is especially intended for the preparation of microscopic objects, and which appears likely to prove useful. Beneath a solid table is fixed the pump in the form of a brass syringe. This communicates by an aperture with a smooth metallic plate fixed on the table. When required for use the object is laid on this plate and is covered with an oblong glass box whose edges are ground and greased (being thus rendered air-tight). The syringe being now worked, the air is rapidly removed. The plan was devised by Mr. W. Moginie”. In January, 1868, Hardwicke’s Science-Gossip wrote “Mr. W. Moginie has designed an ingenious improvement in thermometers for suspension outside a window. By the arrangement of the mounting, the tube is turned towards the window sufficiently for its indications to be read off distinctly from the inside. This improved form is sold by Baker of High Holborn at a very moderate price”. That April, the magazine also described a pocket microscope slide cabinet, “Mr. W. Moginie, of 244, High Holborn, has designed a compact little pocket cabinet, which is made of pine or oak, and contains three or four divided trays opening on pivots like a French rule, so that any object in any tray maybe found at once. Each tray holds six objects, and the whole is very compact for the coat pocket, at a moderate price” (recall that 244 High Holborn was Baker’s address). The Popular Science Review wrote that “A Novel Animalcule Cage has been invented by Mr. W. Moginie, in the establishment of Messrs. Baker, of Holborn. It is certainly a vast improvement upon the old live-box, and it is cheap and efficient. In constructing it Mr. Moginie grinds down to a fine surface a little brass hinge, enlarges its two screw-holes to about 3/8 of an inch, and then fastens one of its sides to an ordinary glass slide by means of marine glue. He next cements a piece of thin ‘covering glass’ over the upper aperture in the hinge. The cage is thus ready for use. A drop of fluid containing the animalcules is placed in the aperture of that part of the hinge which is fixed to the slide, and which forms a sort of cell. The other portion of the hinge is then shut down on the fixed part, and this done, the slide may be placed under the microscope. Mr. Moginie's invention we have found both convenient and effective”. Separation from Baker appears to have occurred in late 1868. Documents after that time refer to items being manufactured by Moginie, without any mention of Baker. For example, The Journal of the Quekett Microscopical Club reported in late 1868 on “Moginie's Collecting case - A new form of collecting case has been recently brought before the Club by Mr. Moginie, of 35, Queen Square. It is intended to accompany his well-known collecting stick and apparatus, introduced some time since. It is made of stiff leather, lined with baize, and contains three strong bottles (‘York’ pattern) of the size best adapted for use with the collecting stick, and four smaller bottles. There is also a screwed ring for attaching each of the larger bottles to the stick, a space for the steel cutting hook for gathering aquatic plants, and a small magnifying lens, mounted in horn. The case is made to open like a portmanteau, so that each bottle is easily got at, and no space wasted. The whole is very portable, and is easily carried by means of a strap over the shoulder. The article can be supplied for twelve shillings, or, with the collecting stick, &c., for one guinea”. The following year announced “a new and useful strainer for collecting-bottles, by which the contents of several can be condensed into one, the surplus water passing out through wire-gauze. The apparatus is very portable, and is devised and made by Mr. Moginie, 35, Queen Square, Bloomsbury”. Moginie’s independence from Baker was made explicitly clear in reports of the 1870 Soirees of the Quekett and Croydon Microscopical Clubs, where microscopes were exhibited by “Mr. C. Baker, High Holborn”, and “Mr. Moginie, 35, Queen's-square”. It is thus evident that Moginie worked for Baker between ca. 1861 and the end of 1868. He clearly enjoyed a degree of independence, since he was given attribution for so many of Baker’s products. It is not known whether Moginie separated from Baker in 1866 (when he joined the RMS from 35 Queen Square), failed, and went back to his former employer, or if Moginie owned a shop at Queen Square while simultaneously working for Baker. Moginie continued to innovate throughout his career, perhaps seeking an edge to stand out above his competitors. In 1871, he “exhibited a pretty and portable microscope lamp ... 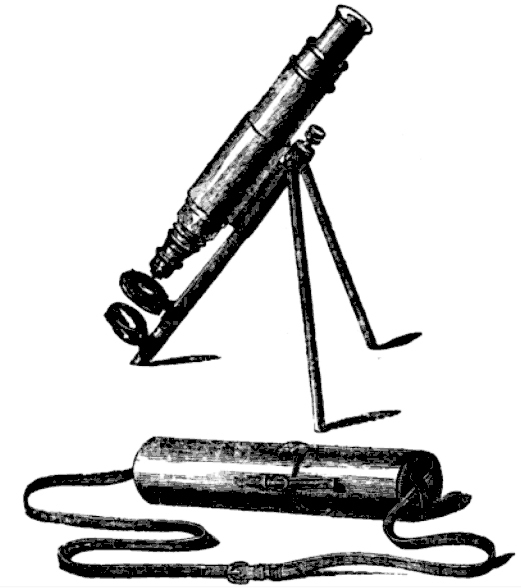 It was packed in a tubular case, like that of a pocket folding telescope, and had the great advantage over a somewhat similarly fitted but much more expensive lamp, that, whereas the latter could only be carried in a vertical position without the oil escaping, Mr. Moginie had, by a simple contrivance, secured his lamp from leakage, even if turned bottom upwards”. Between 1871 and 1872, Moginie moved his business to 14 Riding House Street. Numerous examples of microscopes and other instruments are known to carry this address (e.g. Figure 9). On December 9, 1874, Moginie showed the RMS “a new microscope of large size, arranged with folding legs, to pack in a narrow box. From the stretch of the legs when open, and the disposition of the weight in relation to the points of suspension, it is remarkably steady”. Turner (1978), Kreindler & Goren (2011), and Kreindler & del Cerro (2012) described a microscope owned by M.C. Cooke that was “specially constructed to order by Moginie with large body and rack movement”, and is substantially larger than the standard Baker travelling microscope. This may well be an example of Moginie’s 1874 instrument. On a related note, I agree with Kreindler & del Cerro that Cooke’s description indicates that the microscope was made for him directly by Moginie, and not purchased through Baker. In addition to the popular monocular travelling microscope, Moginie manufactured a binocular version. 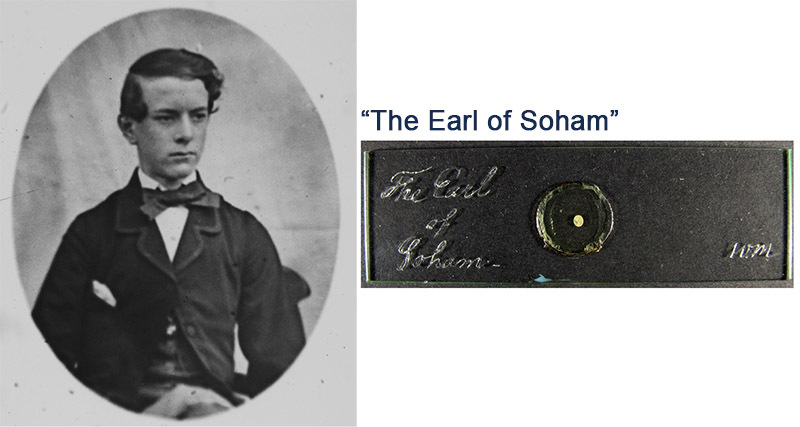 In an 1875 presentation to the RMS, “Mr. H. Lee exhibited with Moginie’s portable binocular, the larval form of the crayfish”. Another variation was also shown to the RMS that year, “Mr. 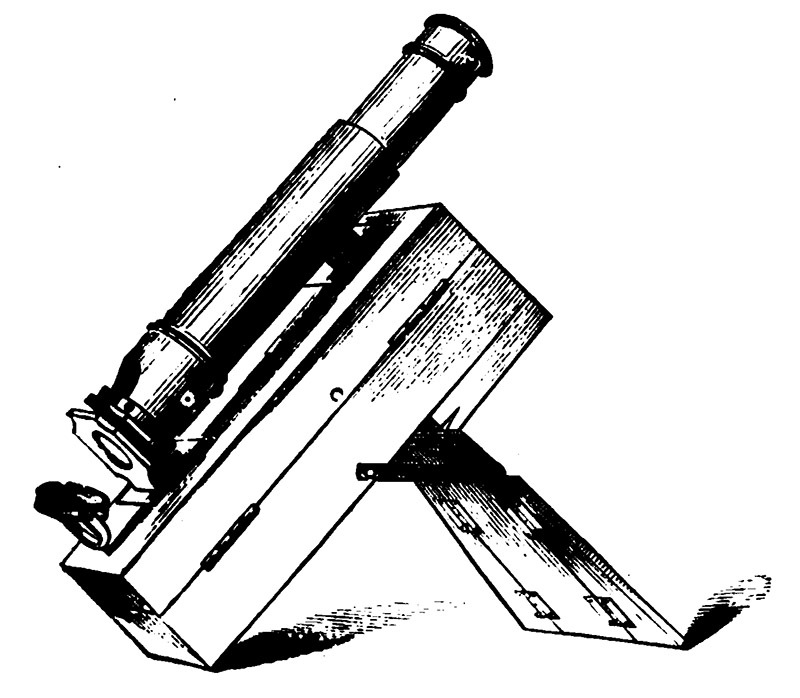 Ingpen described a portable microscope, designed and made by Mr. Moginie especially for use with low powers. The eye-piece was very large, and gave a fine field of view. Its lenses were made to slide instead of screwing, so that they could be very readily cleaned. The general pattern of the instrument was somewhat similar to the portable microscope of the same maker, but the stage was moved by rackwork instead of the body, which was fixed to the stand, thus adding greatly to the steadiness of the whole. The rackwork was sufficiently delicate for use with a 1/2 or even 1/4 inch power. Notwithstanding its large size, the instrument was exceedingly portable, and its wide range and great steadiness rendered it very serviceable for many purposes, particularly in botanical and aquarium work”. Yet another type of traveller’s microscope was apparently designed toward the end of Moginie’s life (Figure 7). It was described in 1887, “This was designed by the late Mr. W. Moginie, in order to provide an instrument which could be very rapidly set up when travelling, and without the necessity of separating it from its case. The limb supporting the socket for the body-tube and the stage is attached by thumbscrews to the upper ends of two pairs of parallel bars, the lower ends of which turn on pivots fixed to the bottom of the box. When the bars are depressed the limb, with the body-tube, stage, and mirror, drops into the box. The loss of time in the operation of taking a Microscope oat of its box and replacing it again is thus avoided. At one end of the box are two flat rods or feet, turning on pivots and allowing the box to be inclined, as shown in the fig. On the bottom are two similar foot which also turn on pivots, so as to extend horizontally on either side of the end of the box, increasing its stability when the Microscope is used in a horizontal position. The box contains eye pieces, cameras, animalcule boxes, and other accessories”. 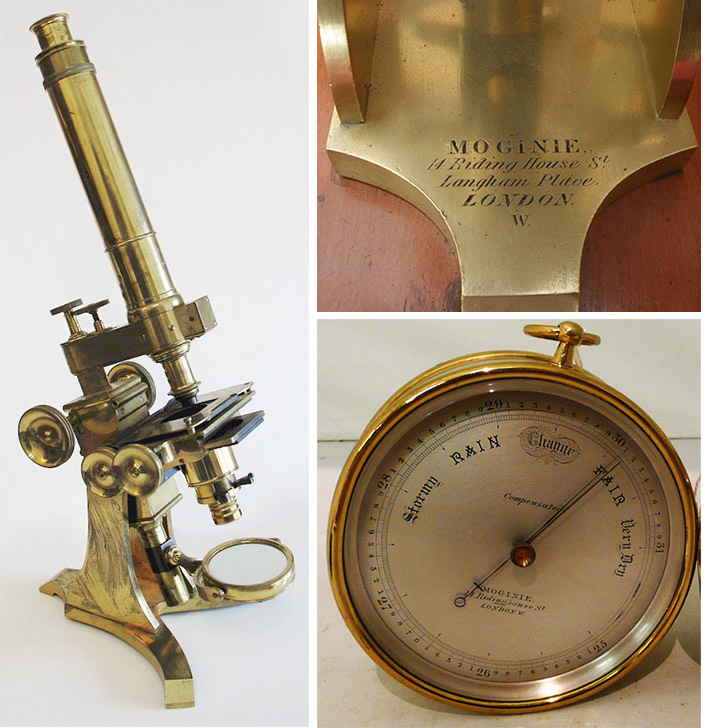 At the 1875 Annual Soiree of the QMC, Moginie displayed, “Microscopes. Portable Travelling Microscopes; Portable Lamps; Revolving Stereoscope, with 36 glass stereographs of British, Continental, and American scenery”. 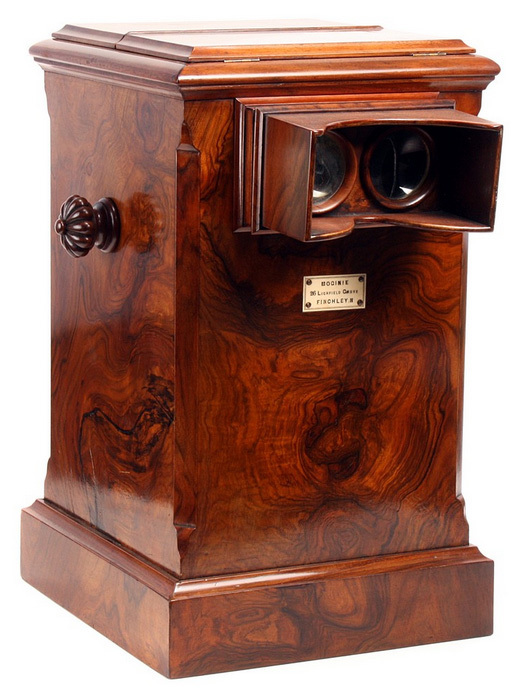 An example of a Moginie revolving stereoscope is shown below in Figure 12. A final example of his inventiveness, to the 1877 Annual Meeting of the QMC, “Mr. Moginie had also brought for exhibition a very ingenious metal mounting for a portable microscope, for special use with the camera lucida. The body of the instrument was fixed horizontally upon a series of bars connected together so as to produce a parallel motion, by which means the microscope could be elevated at any height from the paper, from 3 1/2 to 10 1/2 inches, always remaining perfectly parallel to it, and thus enabling drawings to be made on any required scale. The instrument had been made for Mr. Tuffen West”. West was a highly regarded illustrator of microscopic objects, so his endorsement of Moginie’s craftsmanship bears great weight. The long-time bachelor finally married, in June, 1878, when he was 49 years old. His bride, Mary J. Grindley, was 19 years his junior. A wedding announcement indicated that Moginie still lived at Riding House Street. Within the next few months, the Moginies moved to 26 Lichfield Grove, Finchley, N. A microscopes with that address is shown in Figure 10. Moginie died on December 13, 1881. His will left an estate of £12349 8s 11d. That sum suggests that his business was fairly successful. To judge from the small number of Moginie instruments encountered nowadays, it appears that his output was rather modest. He frequently exhibited at London-area soirees and other meetings, but no print advertisements have been located, suggesting that clients were recruited by personal encounter. His obituary in The Journal of the Royal Microscopical Society read, “William Moginie (elected 1866, died 13th December, 1881, aged 53). Mr. Moginie from early youth took great interest in microscopical and other scientific pursuits, and as an amateur was one of the first to produce micro-photographs, some of which have never been surpassed. 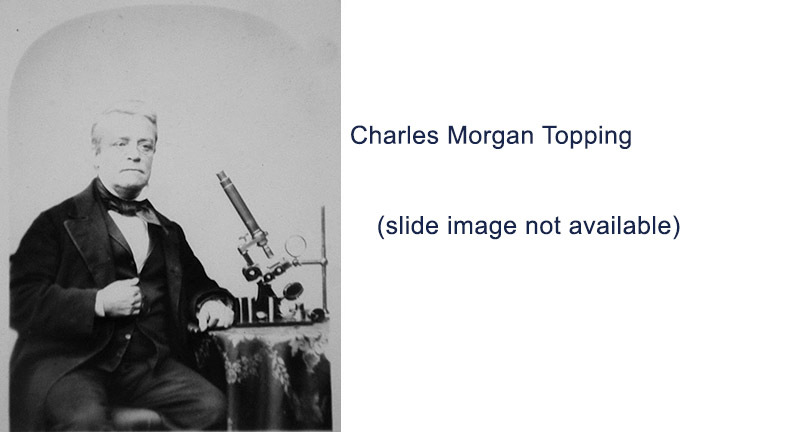 He also made several improvements in the instrument, the chief being the 'Moginie Travelling Microscope’, one of the most convenient of portable Microscopes. Besides being well known as a practical optician, possessed of great mechanical ingenuity, Mr. Moginie was especially noted as a demonstrator, there being few who could exhibit an object with equal skill as regards definition and illumination. Microscopists have lost a prominent and valued member, and his considerable circle of acquaintances a kind and warm friend”. Figure 5. 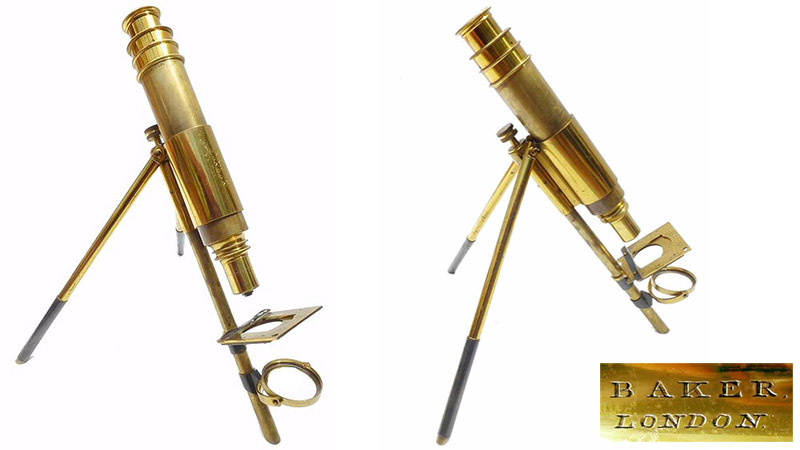 Moginie’s 1866 “Pocket Microscope”, manufactured by Baker. The Popular Science Review wrote, “A pocket compound microscope, of very ingenious construction, has been devised by Mr. William Moginie, of Messrs. Baker's establishment. When packed in its case the instrument appears as a small oblong box, which may be easily placed in great-coat pocket. When required for use, the ‘body’, containing an attached stage, is taken out and fastened on the cover, into the lower part of which a small mirror is inserted. A leg, moving upon a hinge, then pulled out from the bottom of the case, is fixed by means of a catch, like a house-ladder, and the apparatus is ready for use. Alteration of focus is obtained by an easy telescopic movement, and as the universal screw is employed, any objectives may be used. 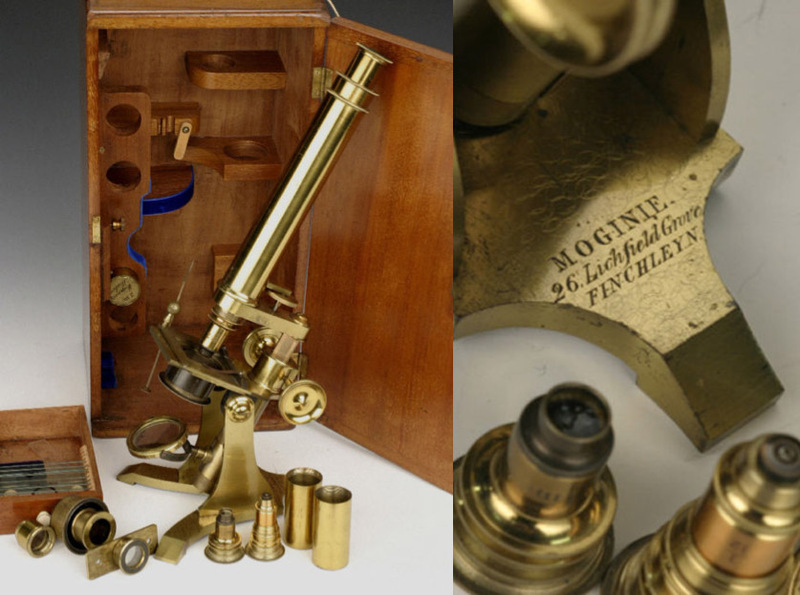 We have used Mr. Moginie's microscope, and can speak well of it. It is a handy instrument, and will be found useful by hospital physicians and field botanists”. Figure 6. An 1867 illustration of Moginie’s “Travelling Microscope”, as produced by C. Baker. Adapted from The Quarterly Journal of Microscopical Science. Figure 8. 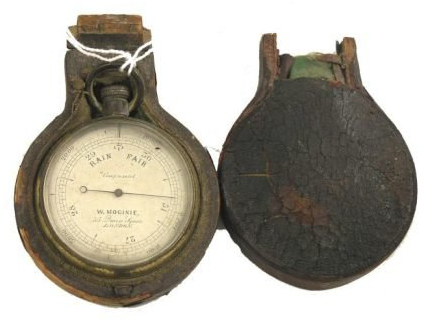 A barometer by William Moginie, marked with his address of 35 Queen Square. That address dates this instrument to before 1872. Adapted for educational, nonprofit purposes from an internet auction site. Figure 9. A microscope and barometer by William Moginie, from his address of 14 Riding House (Ridinghouse) Street. They date between 1872 and 1879. Adapted for educational, nonprofit purposes from an internet auction site. Figure 10. A Moginie microscope. His address of 26 Lichfield Grove, Finchley, dates this to between 1879 and 1881. Adapted for educational, nonprofit purposes from an internet auction site. Figure 11. Two objective lenses, manufactured by William Moginie. Adapted for educational, nonprofit purposes from internet auction sites. Figure 12. A stereoviewer by Moginie, with his address of 26 Lichfield Grove, Finchley. Adapted for educational, nonprofit purposes from an internet auction site. Many thanks to Richard Courtiour, Trevor Gillingwater, James McCormick, and Yuval Goren for generously providing images.